First determine if your water heater is a gas or electric unit - and be sure to stay safe! Natural gas can explode. If you decide to attempt any repairs, make sure the gas is off. Any hot water still in the tank can be very hot. Take precautions not to get burned. Traditional water heaters hold an enormous amount of water; opening the drain valve will cause the water to empty quickly. Water can damage your home's furnishings or finishes as well as your personal belongings. Finally, if you decide to attempt any repairs, turn off the power. The combination of volts and amps in an electric water heater can be lethal. BE CAREFUL! 1. Check the pilot light. 3. Check all switches, fuses, and circuit breakers to be sure there is power to the unit. 4. Check the exhaust flue or vent to be sure it is not clogged. 5. Be sure the gas is on. 1. 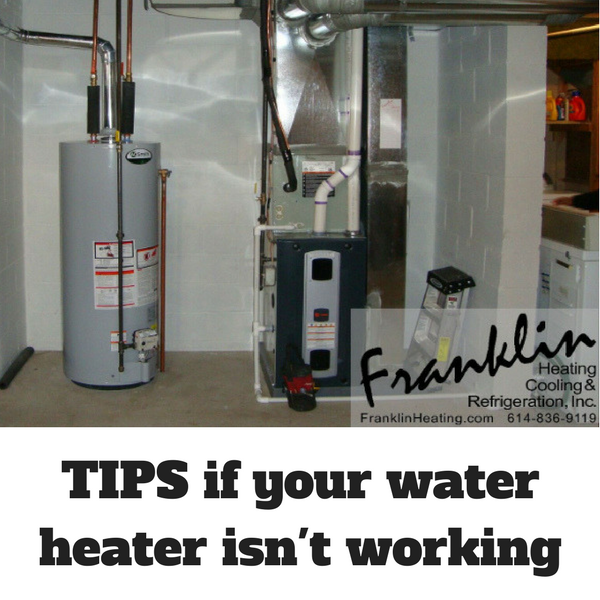 Check the breaker and hit the reset button on the unit's heating element. Unfortunately, when the water heater is making either of these things trip, there is usually another problem. If these measures don't solve your problem, count on the experts at Franklin Heating Cooling and Refrigeration. Give us a call (614) 836-9119! 24-hour emergency service is available and our phones are always answered by a live person. Known for service and value that is second to none, Franklin Heating has been in business for over 22 years and has an A+ rating from the Better Business Bureau. Rest assured that you are receiving the industry's finest service. Family-owned and operated, Franklin Heating Cooling and Refrigeration is an Ohio licensed business founded in Groveport, Ohio in 1994. Our expert technicians proudly serve the Greater Columbus area as well as Delaware, Fairfield, Franklin, Hocking, Licking, Madison, Pickaway, and Union counties. Franklin Heating Cooling and Refrigeration, Inc.
© 2018 Franklin Heating Cooling and Refrigeration, Inc.